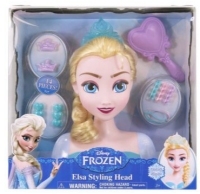 One of the must have toys for Christmas 2014, the Elsa Styling Head is currently in good supply throughout the UK. We constantly track for stock which ensures you will be the first to know when availability is found. Give Elsa a glamorous makeover with this great styling head from the character of the popular Disney film Frozen. Make up Elsa's long blonde hair as you like ready for a night out or daytime adventures. Once you are done styling her hair, top it off with the ice-blue tiara on her head. The options for her hairstyles are endless! 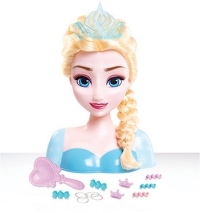 The Elsa Styling Head comes with 13 accessories to create the look you desire. We constantly check for Elsa Styling Head stock, so you don't have to. Receive email alerts when Elsa Styling Head online stock is found.